Trash pickup and Recycling Convenience Center schedule changes during holidays: Holiday Schedule. Composting is a great way to keep organic materials out of refuse, which diverts waste from the landfill and also cuts down on the potential for "refuse juice" to spill on the street and enter the storm sewer system. 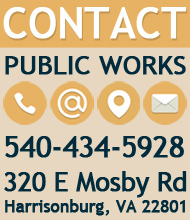 Although the City does not provide curbside collection of compost, did you know that there is a public compost drop-off location in Harrisonburg? The Climate Action Alliance of the Valley collects compost near City Hall in parking lot at S. Liberty St. and Warren St. More information. Small businesses, who have city or private refuse collection, are still encouraged to source separate recyclables and drop at the Recycling Convenience Center.